Skokie Chabad Hebrew School offers a warm and lively Jewish atmosphere where children attain an exciting awareness of their Jewish identity. A child equipped with Jewish knowledge and sensitivity to our beautiful teachings and traditions is a child better equipped to face the awesome moral challenges that confront us each day. Aside from the acquisition of Jewish knowledge, our approach places a strong emphasis on creating a positive, vibrant and joyful environment to ensure the children’s continued interest in Judaism even as they move on in life. Our program is thus full of educational games, incentives, crafts, drama, family celebrations, and other engaging curricular activities. We encourage you as a parent, to get involved and be in-tune with the material your child is learning. You may discover that your child’s Hebrew School education will add an enriching spiritual dimension to the life of your entire family. Identify strongly as a Jewish person. Know the why’s and how’s of Jewish life and gain an appreciation for the values and mandate of the Jewish people. Become familiar with basic Synagogue prayers and traditions. Know the basic history of the Jewish people and its contemporary relevance. Become comfortable expressing their feelings about G‑d, Torah, and religion. Attain a Jewish perspective on life which will influence their involvement beyond their Hebrew School years. A school year calendar can be found here. Skokie Chabad Hebrew School is located at 4059 Dempster, Skokie, IL. Please share your feedback and suggestions regarding any aspect of school. Your input allows us to constantly improve and upgrade our program and we value it greatly. Hebrew School Updates, changes or notifications will be made by regular e-mails. Photos of school activities are displayed on our website here. Parent-Teacher rapport is extremely important. Skokie Chabad Hebrew School is run by a staff of dedicated teachers. Each of them spends hours planning their lessons and designing creative methods of teaching. They genuinely care about the progress of each student and would be happy to discuss your child with you. Please call our office and we will make arrangements for you to speak with your child’s teacher. In the event of inclement weather, parents will be notified by email if Hebrew School has been cancelled. The teachers will see to minor injuries. Should something more serious occur, G‑d forbid, the parents will be contacted immediately. Should the parents be unavailable, the child will be taken to the nearest hospital. Snacks and drinks are provided by the school. Please avoid sending any food to school. 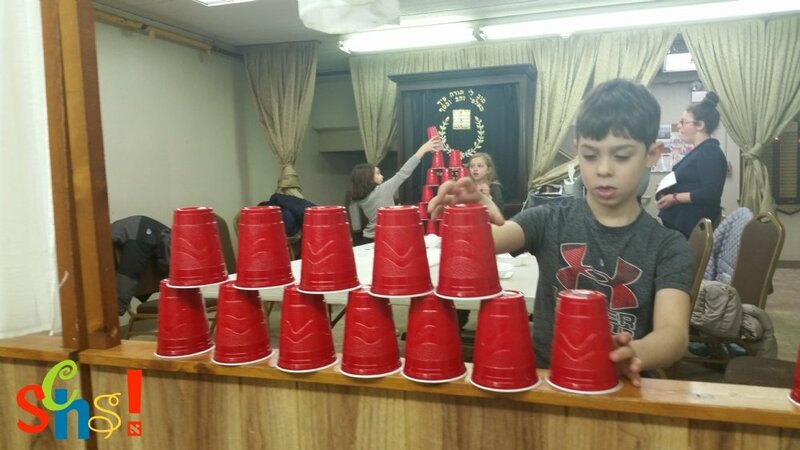 Skokie Chabad Hebrew School strives to create an atmosphere that reflects our Jewish values. Boys are encouraged to wear a kipah. For those who do not bring, we will supply one at school. Tzedakah – Charity is an important part of our curriculum, and we encourage students to bring a coin every Sunday to help fill up the class Tzedakah Box. As the boxes fill, the children will count it and discuss with each other where to allocate the money to help the needy. Hebrew School for all grades is held on Sunday morning from 10:00 AM to 12:00 PM. For the benefit of your child and all students, it is imperative that your child arrives on time and remains in school until the end of the session. Consistent and timely attendance is vital! Please make Hebrew School a priority and impart this sense to your children in unequivocal terms. Please schedule parties, play dates, sports activities and meetings after Hebrew School is over. Students are not permitted to bring cell phones, i-pods, electronic gadgets or any dangerous objects to School. In the event that a student brings them or any other materials we deem unnecessary for learning, the teacher will hold it for safekeeping and will return it to the parents at the end of the day. We respectfully request that parents take the lead in enforcing this rule and not put the administration in an uncomfortable position. The Hebrew School program includes occasional exciting and educational field trips. For school trips, transportation arrangements will be made. We may ask parents to help carpool and accompany us on these trips. Please notify us in case of contagious disease so that we may alert the parents of other children in the class to be aware of the symptoms. Please let us also know if there are any changes in your child's health during the year e.g. vision, hearing etc. This will help us understand and cater to his/her needs. In order for our Hebrew School program to be most effective, the home and school must work hand in hand to promote a close relationship. The following are a few suggestions to aid you in allowing this to happen. A growing child needs plenty of rest. Set a reasonable bed time the night before a school day. Many of our students are involved in other extra-curricular activities (e.g. sports, music, etc.). All these are important; however please make your child’s Jewish education a priority. There is a direct correlation between a student’s attendance, and his/her interest, achievement and attitude. Every time your child is absent, there is a loss of continuity to the program. Keep your child in school regularly. Please help your child come to Hebrew School on time. The place to voice your concerns of the school is with the school director and teacher in private. Please do not discuss school issues in the presence of your child. Participation in synagogue services and celebration of Jewish holidays will greatly enhance your child’s interest in Judaism and strengthen his/her Jewish identity. Our director and teachers are always willing to provide resources, share their expertise, and help out however possible. Encourage your child to practice their reading skills and review during the week. Our review pages are here. Show your child that you are interested in his/her Jewish education. Spend time with your child reviewing what he/she has learned in class and listening to him/her read Hebrew to you. This will greatly encourage and help foster a strong and positive identity. Skokie Chabad Hebrew School strives to give your child an exciting experience in a nurturing Jewish environment. We look forward to a fantastic year where you will see much joy from your children.